Meet Jana, an Amazing Amateur Concert Photographer! One of the best things about the Internet, social media, etc., is the opportunity to discover new people and artists. 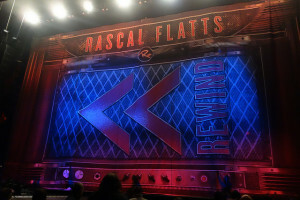 Last year, in looking through Flickr in search of photos of our custom stage drapery and band backdrops on location, Megan came upon the photostream of Jana Zills that included some amazing photos that Jana took at last year’s Rascal Flatts concert, including several that featured the custom backdrop that Sew What? made for the tour. Megan included the photos in our Rascal Flatts Flickr Gallery, and through comments back and forth about the photos, Megan and Jana got to know each. 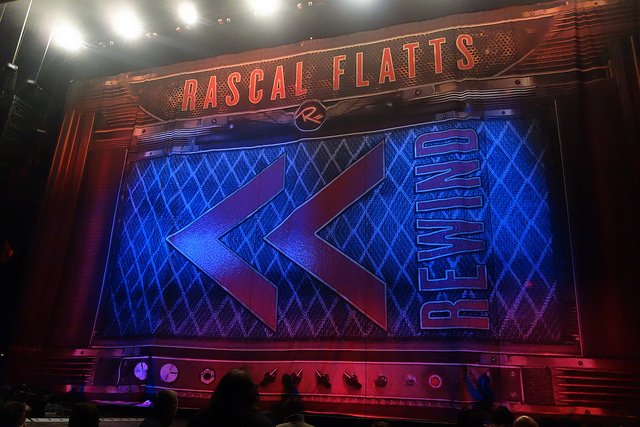 This year Jana was nice enough to let Megan know that she had taken photos of this year’s Rascal Flatts concert – again featuring a custom digitally printed backdrop by Sew What? Inc.
I’ve been doing live music photography since 2002, when I was a teenager. It was something I picked up at a live music show my parents took me to. I had disposable cameras then. I have a natural talent for live music photography. Since then I’ve been to over 250 live music shows, not missing a single photo opportunity. In 2013, I believe, is when things started to get more involved with my photography. I shot a Taylor Swift show from the second row in March of 2013 and in October I had an editor of a live music audio magazine highly interested in my photos. We agreed on a deal and he published 5 of my photos from that show. I don’t do this for fame, money or even to get published. I do it for the people who might’ve paid $30 for tickets, sitting in the nosebleeds, dying to be up close and personal with their favorite artists. I have many people on social media who follow what I do and are a great constant support for me and what I do. I’m blessed in my opportunities to get up close and personal with my favorite artists. Check out Jana’s photostream for some wonderful concert photos! Al finalizar el diseño conjunto para la próxima gira, ¿Está usted confundido en cuanto a qué sustrato digitales funcionaría mejor para las necesidades de su pintoresco telón de fondo? no hay que preocuparse. Hay una gran variedad de sustratos disponibles para imprimir directamente en una impresora digital de gran formato, Así que seguramente abra uno que sea adecuado para usted. Va estar su gira tocando en lugares cerrados, desde pequeños teatros a grandes estadios de interior? Un sustrato de tela es generalmente la mejor opción, con opciones que van desde tejido pesado y lona de algodón (grandes opciones para la iluminación frontal) a Artist Light (ideal para la iluminación trasera). Va estar su gira tocando en estadios al aire libre y festivales? Considere la posibilidad de un sustrato de vinilo de malla o de vinilo mate para una mayor durabilidad y resistencia a la lluvia. Preocupado por el viento? Vinyl Mesh es el sustrato para usted, ya que permite que el aire sople a través. Tienen una preocupación por algún otro elemento de productos blandos? Gustaría algunas ideas para el estilo correcto de cortinas del escenario a medida para adaptarse a su visión? Nos encantaría saber de usted en la sección de comentarios. 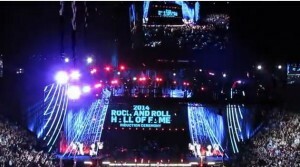 We were honored to be selected for the second year in a row to provide rental drapery for the Rock and Roll Hall of Fame 2014 Induction Ceremony, held this year at Barclays Center in Brooklyn, New York. The pewter (grey) color of the drapery is perfect for stage lighting – the drapery can appear to change color simply by utilizing different colored lights – and the slight “crushed” nature of the fabric provides texture and depth to the scene. Kudos to our own Shane Nelsen, who traveled to New York to oversee the installation of the drapery – it looks great! Want to see more? The Rock and Roll Hall of Fame 2014 Inductee Ceremony will be broadcast on HBO at 9pm on May 31. Thanks to an infusion of energy and some great guidance by Randy McKinley of CMTC, there have been lots of changes going on here in “What?-Ville”. Indeed – it is starting to look more and more like a village! We have just finished installing some beautiful cabin-style offices on the factory floor – part of our effort to integrate processes at both the sales and manufacturing levels. Brand new super modular construction, the lucky employees moving to their own cabins include Andrea (Printing Department Manager) Marianne (Logistics Manager) and Rick (Warehouse Manager and Master of all Company Miscellanea). These creative new spaces are adorned with big windows, air conditioners and heaters, bright lighting and lots of natural light, too. Brand new shiny office furniture is on order – and with the freshly laid carpet already in place, we are moments away from making the transition…….. Can’t wait! Some major process changes over the last few months are now starting to deliver as promised….. A combined shipping department servicing both rental and sales shipments – and the same for our receiving department. This new blended formula now delivers a speedier and slicker service to our WILL CALL and delivery clients. No longer two companies under one roof – we are now one company offering two services…. with a single point of contact. In looking back over the last 17 years, I might equate the growth of our business to often mimicking a “bad extension” to a home…… First you add a bedroom, then a bathroom, then blow out a few walls, and before you know it you are eating in the garage and have to walk thru a bedroom to get to the powder room. 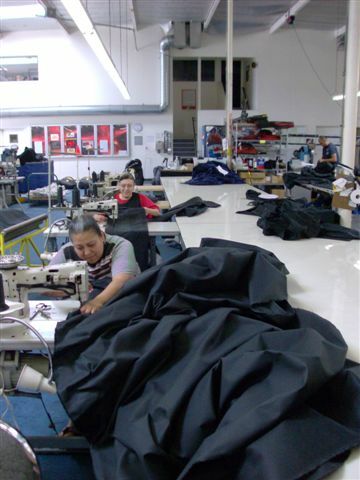 Well, we had certainly grown in some hazardous ways – but this thoughtful reconfiguring of the warehouse, the processes and the attitude towards production has us all feeling great. Does the design for your upcoming tour or event call for dramatic stage drapes in shades of red, but you’re not sure exactly what style of drape would work best for your design? 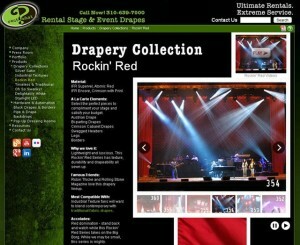 If so, check out our Rockin’ Red Drapery Collection to explore the many possibilities available in rental stage drapes. The collection includes drapery in several shades of red, including burgundy, and a wide range of styles. From borders and swags to pleated legs and drapes to Austrians and Venetians, there is sure to be something that fits your design vision. Want to learn more about the Rockin’ Red Drapery Collection? Start with our website. It’s a great source of information on the collection. Another informative resource is our Rockin’ Red video on YouTube. I love how the video shows how different drapery from the Rockin’ Red series can be used to create so many different designs. And for even more inspiration, we’ve got lots of photos of Rockin’ Red drapery on Flickr. This photo of Monsters of Folk features a gorgeous Burgundy Velour Venetian (Contour) Drape. Make sure to scroll through the set to see more photos and see how stage lighting can even change the color of the drapes! 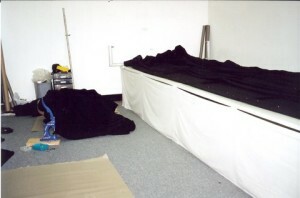 And, of course, feel free to call us to discuss your project – we would be happy to recommend rental drapery that is just right for your design vision.